Today as part of kid’s week I am sharing an article and recipe that I wrote for meal planning/recipe site Food on the Table. These are some tips on ways to get your little one excited about dinner and how they can help in the kitchen! And what is more popular with kids than taco or pizza night so why not combine them for Taco Pizza! Cooking with children and allowing them to help in the kitchen, not only provides special family time but also develops important life skills in a fun learning environment. Here are some easy tips for cooking with your kids and an easy kid-friendly recipe to try. Let them help plan the menu and choose the recipe. This can be a fun activity that you do with your child. Pick out several cookbooks and sit down with your child and decide on what recipe you will make. If your child is old enough, allow them to read the title of the recipe and the list of ingredients. If they are too young to read on their own, read the ingredients to them, re-enforcing the ingredients/foods that they like. Give them their own tools. A lot of kitchen utensils can now be found in a variety of colors and can be bought inexpensively. Having their on tools/equipment makes children feel special and will get them excited about cooking. Children as young as three can help by pouring, mixing and stirring and will take pride in knowing they helped prepare that night’s dinner. Make grocery shopping fun. As much as I love food and cooking, I dread grocery shopping and having kids in tow doesn’t help the process. However, the grocery store can be a great learning environment for children. The produce department is a wonderful place to teach young children about colors and counting. Older children can also have fun by going on a ‘scavenger hunt’ to help find the items on the shopping list. Make the dinner time special. Cooking and baking can be fun and enjoyable activities. Schedule one night a week that is “Kids Cooking Night” and allow them make the recipe they choose. You can even ask your kids if they would like to invite a special dinner guest (a friend or family member) to come eat the meal they prepare. Allow them to name their dish (Tommy’s Terrific Tacos) and choose any special plates, tablecloths or napkins to use to set the table on that special night! Pizza is the perfect kid-friendly recipe! It is much cheaper to make at home than order out and is something that is easy for kids to make. They will have fun rolling out the pizza dough, spreading the sauce, and carefully choosing and placing the toppings. 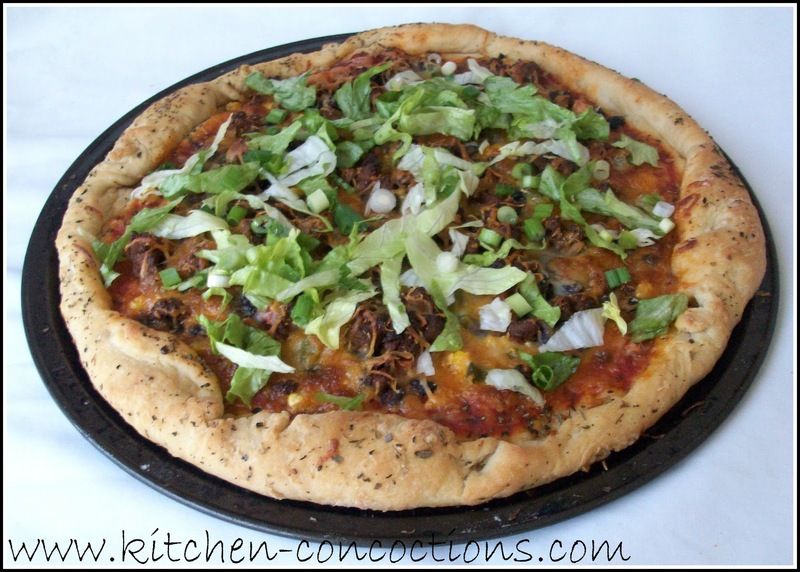 The pizza recipe below takes another kid favorite, tacos, and transforms it into a fabulous pizza! Brown meat in a large skillet. Drain grease from pan. Add taco seasoning and water. Let beef cook in taco seasoning and water for an additional 5 to 8 minutes. Mix enchilada sauce and marinara sauce in a bowl. Roll out both packages of pizza dough and spread the enchilada/marinara sauce mixture over each pizza. Top each pizza with the prepared ground beef, tomatoes, corn, and black beans. Cover the toppings with the cheese. Bake the pizza in a 350 degree oven for 20 minutes or until the crust is golden brown. Remove pizza from oven and let cool slightly. Top cooked pizza with shredded lettuce and serve immediately.